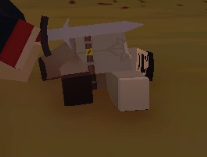 Whats your most cursed Unturned 3 screenshot? Is that a tank? It looks awesome. theres a good reason why the forum hates it. Because they cause mega lag, and usually don’t look good. It’s easier to make custom objects then it is to make good compound, and one runs 100% better. What are you onna bout!? Yeah I have already been informed about the whole context of these images at a previous date by Noobyfish.